Congress Vice President Rahul Gandhi addressed the annual general meeting of industry body Confederation of Indian Industry (CII) on Thursday, a day after Prime Minister Manmohan Singh addressed the event assuring confidence in investors. 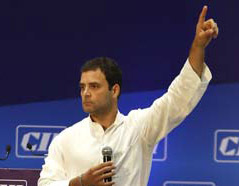 In his first elaborate interaction with the industry, the 42-year-old who is seen as the next Prime Ministerial candidate of Congress dubbed as “irrelevant” the talk about whether or not he would lead the country, saying one individual could not address all the complex problems of the country. Describing his advent into politics as “an accident of fate” and “DNA” linkage with a particular family, Gandhi said, “I am not a hard-nosed politician… I don’t want to become.” He sought to dispel the notion that “one person charging on a horse” would fix all the problems of the country. “No, it is not like that,” he added. The Congress Vice President shared his vision with the top business leaders of the country during an hour-long interaction at CII meet in New Delhi, emphasising on the need for bringing about structural changes to empower common people and providing basic infrastructure in all respects. He praised India Inc. for introducing the country to the world. “When I went to university in 1991, nobody knew India…that is not the case now thanks to you people,” he said. Gandhi called for inclusive growth, and warned repeatedly of the dangers of centralisation of power. In comparing India with China, he said India was a country with “complexity” and used the analogy of a “beehive”. “China is referred to as the ‘dragon’ and India as an ‘elephant’. But we are not an elephant, we are a ‘beehive’, ” he said. However, he pointed out that unlike a “beehive which gives every member a voice”, the system in India is “clogged” and the voices of most people are not heard. He said the answer to these problems lay in empowering the lowest man. “Let us work together to build a brave empowered India,” Gandhi said while inviting the business to partner the government in ensuring growth. Underlining that Congress is the only party which believes in taking everyone along, he said the country has witnessed faster economic growth under the UPA because it had greatly lowered tensions among communities and fostered harmony. “When you play the politics of alienating communities, you stop the movement of people and ideas. When that happens we all suffer. Businesses suffer and the seeds of disharmony are sown and the dreams of our people are severely disrupted,” he said, adding that this damage takes a very long time to reverse. “The biggest danger is excluding people, including the poor, minorities and dalits… Anger, hatred and prejudice do not help growth. If you alienate communities we all suffer,” he said. Noting that millions of youngsters have optimism even as they struggle every day, Gandhi said, “We are readying to build a new political architecture”, in which all voices, including business, will be incorporated. The country’s “economic vision must be about more than money. It should not leave anybody outside. It must have compassion. Embracing the excluded is essential for wealth of the nation,” he said.